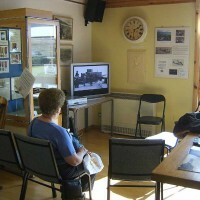 Barra Heritage and Cultural Centre, (local name Dualchas) is situated in Castlebay, houses an excellent collection of local photographs and artefacts pertaining to the local history of the Isle of Barra. There is also a restored thatched house and craft shop. 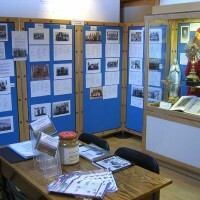 It is run by Barra and Vatersay Historical Trust on behalf of the Barra and Vatersay Historical Society. The artefacts include furniture, household and personal items, and exhibits relating to the fishing industry. During the summer there are temporary exhibitions of local history and art. A cafe serves snacks, home-baking, teas and coffees. The centre, has two main galleries, and a cafe. There are facilities to sit and look through their achieves, as well as look at the displays of local interest and culture. All proceeds from the admission charge go towards running the centre. Dualchas is run by enthusiastic volunteers. If they don’t know the answer to your enquiries, they will certainly have a good search on your behalf. 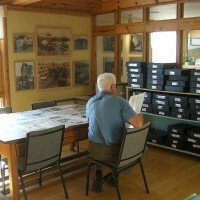 The centre offers a range of genealogical services to those wishing to trace their ancestors or roots on the island.